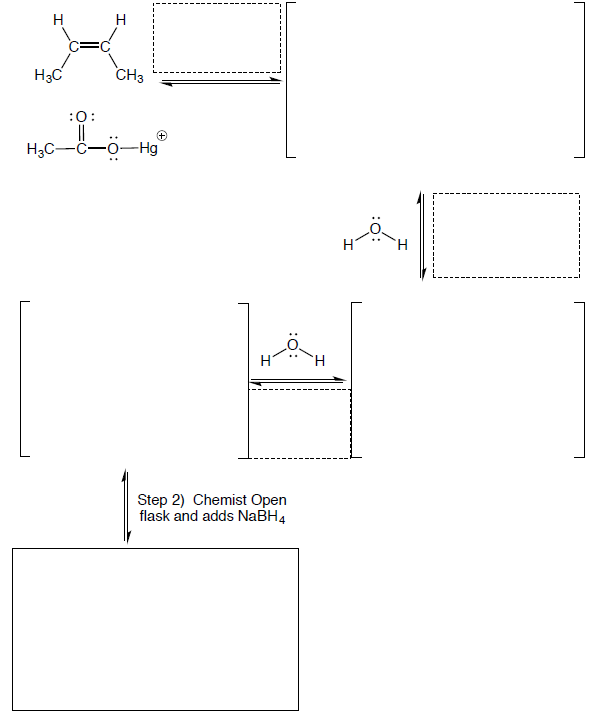 Solution: Complete the mechanism for the following reaction. Draw all the arrows to indicate movement of electrons, write all lone pairs, all formal charges, and all products for each step. In the dotted boxes write which mechanistic element is involved in each step. If a racemic mixture is formed in the final product, you must draw both enantiomers and write racemic. Complete the mechanism for the following reaction. Draw all the arrows to indicate movement of electrons, write all lone pairs, all formal charges, and all products for each step. In the dotted boxes write which mechanistic element is involved in each step. If a racemic mixture is formed in the final product, you must draw both enantiomers and write racemic. What is the major product from this reaction? Provide the missing reagent or product.